We have a feeling that there are many dentists/local business owners who know very little about search engine optimization who have this misconception, that there should be no ongoing SEO service involved. Side note, it is interesting how someone would think that a monthly fee of $500 for a Yelp ad that doesn’t produce any patients is reasonable, but a monthly fee of $250 for a website that produces 4 new patients per month and $5,200 in revenue is high. If you are under the impression that search engine optimization is just something that is put into the website and then it automatically maintains high rankings. If you read anything at all that is a good source of information about search engine optimization, you will learn that a site needs to be well maintained in order to rank well. A site that is ignored will always decrease in rankings and traffic. Sometimes those decreases can be dramatic – usually they are merely gradual. The answer is YES. You need ongoing SEO maintenance to maintain your rankings. Search engine optimization is one of the best investments you can make online, because it’s (1) high-quality traffic with intent to buy, and (2) your ROI scales and gets better over time. I firmly believe in ongoing SEO and how useful it can be if the contract is built with specific goals in mind. SEO is an ongoing process — there are always things to test and optimize. New content should be added to the site regularly as well as updating the current content to keep it fresh. • How competitive is your industry? • How competitive are your keywords? • How savvy is your competition? • What resources do you have, in-house or external? • What ongoing marketing activities do you plan on doing? • What ongoing content do you plan on creating? • Who reviews your analytics now? • Who maintains your website now? If you can’t answer any of the questions above you need SEO maintenance. We have emphasized throughout this document that SEO is not a one-time certification. Search engine algorithms are constantly changing, and every day search engines are crawling the Internet and adjusting search engine results page (SERP) to reflect updated content, new sites, and shifting dynamics in site linking and popularity. To maintain a popular web presence and stay at the top of the search engine for your keyword phrases, you need to regularly monitor your website, the competition, and the latest trends in keyword searches you used to optimize your site. To achieve and hold a top SERP, you must stay ahead of all competitors for the keyword phrases you used in optimizing your site. If you knock someone out of the top ten results on a SERP, you can be sure they will be doing everything they can to get back on top. Competitors try to and WILL outrank you. You cannot ignore your competitors, because they will not ignore you. If you rank higher than them on the SERP, you can be sure they will be working to outrank you. That is why SEO Maintenance is critical for clients interested in attaining and maintaining top results in the search engine pages. Many businesses do not have SEO maintenance because it is time consuming—keeping up with search engine trends, need to make constant SEO tweaks to website, and the importance of keeping content fresh. Let our SEO analysts do the work for you. 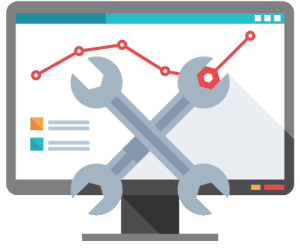 Contact us now to find out how we can help you with your SEO maintenance.